Are Lash Extensions Right for You? Thick, long lashes have long been the standard of beauty for women, who use everything from mascara, eyelash curlers and even false lashes to achieve the look. If a $30 tube of mascara can give you thick, full lashes, why bother with the time and expense of our eyelash extensions? Mascara is marketed like any other beauty product, continually promising women a newer, more improved version that can lengthen, strengthen, and thicken lashes, without clumps. While eyelash extensions may not be for everyone, the benefits compared with mascara and/or false lashes you glue on yourself may surprise you! Eyelash extensions can actually create more drama than mascara, while looking even more natural. No clumps or "goopy" look when trying to get really dramatic looks with mascara. A full set of eyelash extensions can lengthen your lashes up to 50%, and will thicken them by 30 to 50%. 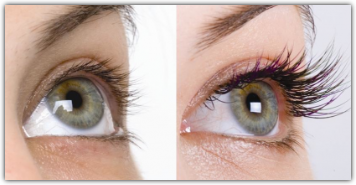 Eyelash extensions come in a variety of lengths, curls and colors, from 6-millimeter to 15-millimeter lengths. Standard eyelash extensions are black or brown, but other accent colors available include purples and tints of red to create a look all your own. If your eyes are one of your best facial features, you probably spend a lot of time during your daily make-up routine putting your eyeliner and mascara on and getting it to look right (including clean up, combing out clumps, smudging, etc.). With results lasting up several weeks up to two months, eyelash extensions can cut the make-up time in half. One client said, "I actually feel prettier because I wake up like this! My no-makeup look on weekends even looks amazing, and I don't look like a raccoon when I leave work!" Many women ask, why not just use false eyelashes instead of the eyelash extensions? A few of the differences between the two include adhesive formula, lash type, application technique, lash appearance and lasting duration. Traditional false lashes are usually made with a strip or with multiple lashes knotted together and are applied directly on the eyelid using adhesive formulas that can cause discomfort to the eyes and may cause your natural lashes to fall out prematurely. Yikes! Traditional false lashes usually last a day or so, often look unnatural and feel heavy on your eyes. Our eyelash extensions LOOK and FEEL like your own lashes, only much longer, thicker, fuller, sexier and are safe even for those who wear contact lenses. Eyelash extensions are a fun gift to give yourself, so consider taking them for a test drive. Many of our ongoing lash clients began with them for a special event, such as their wedding, but realized they were saving so much time and energy that they continued with them after their first them after their first time. Contact us today for your consultation!